Despite the fact that I usually play Minecraft in the first person view, it is always reassuring to see yourself and know that your skin is representing your Minecraft self. It’s really quite amazing that the entire external appearance of a Minecraft characters is captured in a tiny (231 byte) .png file. I’ve not adjusted my skin since I initially designed it back in June 2012, but I’m looking forward to seeing if there are any tweaks that can be made with the newer Alex skin that is now available. At least some headphones or sunglasses might be cool to try out once in a while. Of course, the Gumby of my childhood was an animated clay television character. With the recent cold and wind chills, we’ve had a good number of indoor recesses, and on a few occasions I’ve fired up YouTube during our nutrition breaks and my students and I have enjoyed a few of Gumby’s early adventures. In recent weeks I’ve been enjoying my custom personal GumbyBlockhead figure from EnderToys.com. Following the simple acts of filling in my Minecraft name, forwarding a small sum ($9.99 for the simple, or $14.99 for bendable legs) and waiting for a couple of weeks, my 3D plastic self arrived. 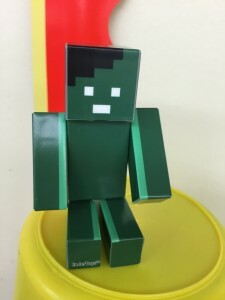 My First Life incarnation of my Minecraft self has taken up residence in my classroom, commanding a view from a bucket perched high atop one of the shelves at the front of the room. 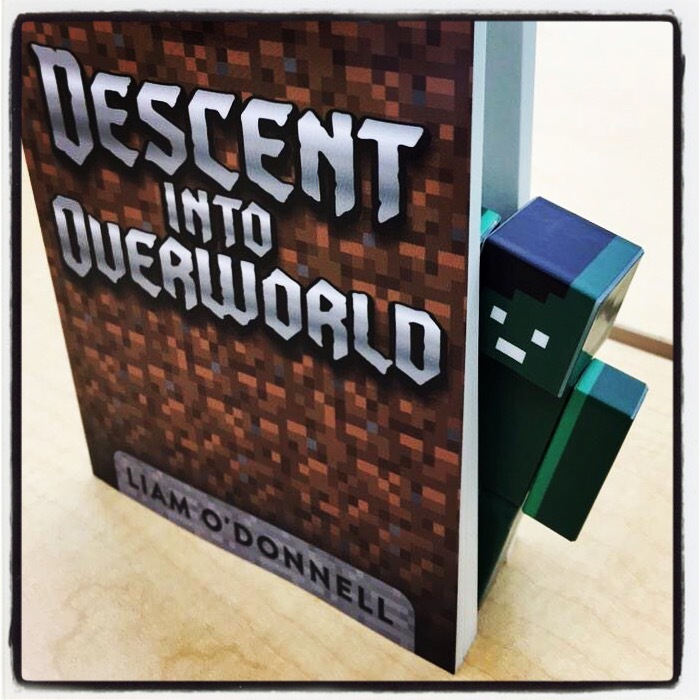 Earlier this week, my physical copy of Liam O’Donnell‘s first Battle of the Blocks Minecraft novel arrived, and the First Life Gumby figure followed in the footsteps of his progenitor by going into Liam’s Descent into Overworld book to get a first hand look. We read the electronic eBook release in my classroom on the iPad earlier this year, and we are now anxiously awaiting the second in the series, Nether Nightmare, due out for beta readers in the coming month! In the meantime, the students are waiting in line to read the paper copy of the first book! Talk about motivation for reading! And then, this afternoon, at the end of the day, I was more than overjoyed when some of my students called me over to an iPad to show me the result of their efforts. 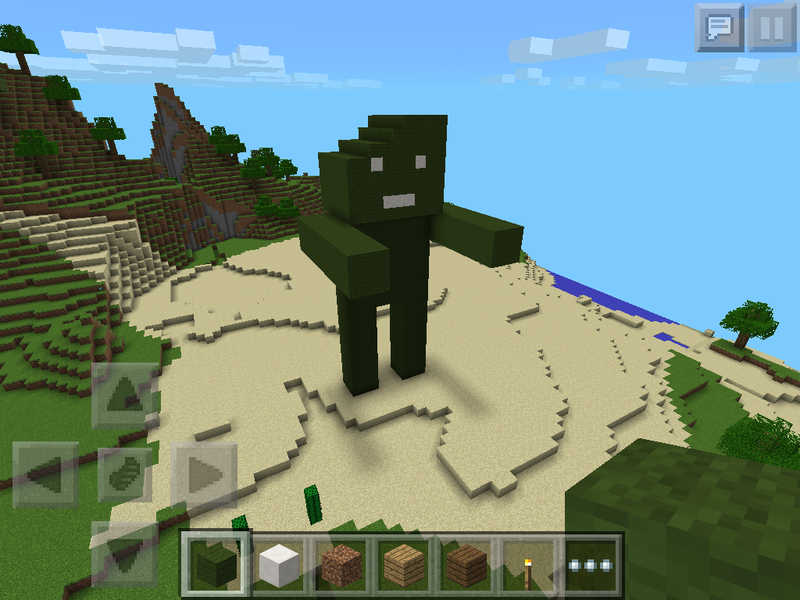 Having finished their assigned work, they had taken a few free moments in the last period to collaborate on the creation of a giant, scale copy of GumbyBlockhead in their Minecraft PE world. How wonderful! They really have done a excellent job, getting the scaling done very accurately, and even getting the slope of my Gumby head looking just right! What a nice gift to end the week! 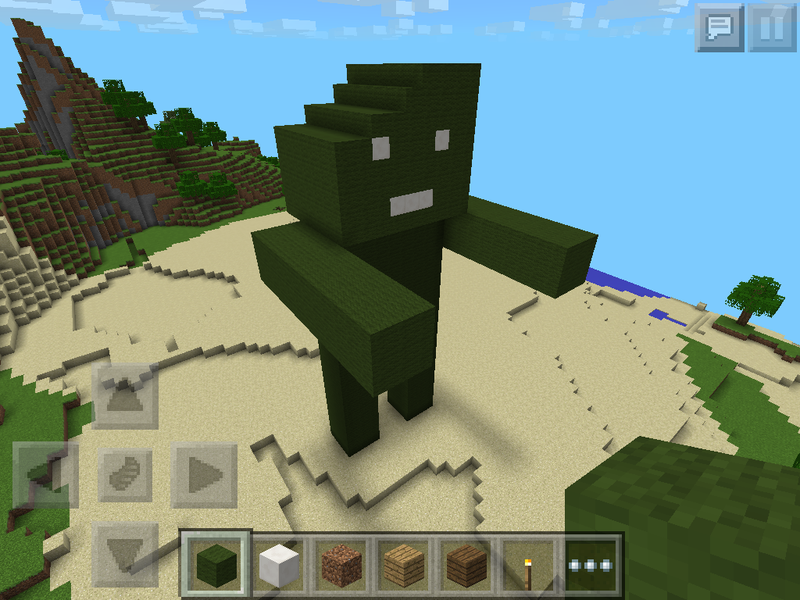 This entry was posted in Identity and tagged @liamodonnell, Battle of the Blocks, Descent into Overworld, EnderToys, First Life, GamingEDUs, green wool, Gumby, Gumby and Pokey, Identity, Liam O'Donnell, MineCraft, Nether Nightmare, plastic, png, Raj, seuscraft.com, skin, YouTube on February 28, 2015 by GumbyBlockhead.